In his pitruvachan held on 24th October 2012, Sadguru Aniruddha Bapu explained the true significance of Vijayadashami – ‘Seemolanghan’. ‘Seemolanghan’ means crossing your boundaries. This does not mean that one should break morals and values. But the true meaning of ‘Seemolanghan’ is expanding limits. Along with Seemolanghan, another vital part of the day is ‘Sinhawalokan’. ‘Sinhawalokan’ means reviewing our own goals, progress, actions and their results. This day is extremely crucial for increasing our capabilities and strength. On Vijayadashami, poojan (worship) of Goddess Saraswati is performed in the morning while that of tools and weapons is performed in the evening. It implies knowledge and science is worshipped on this day. What is the purpose of this? It is done to enhance one’s finesse and coherence. Vijayadashami or Dassera is a significant day in this aspect, and thus, Shree Aniruddha Upasana Foundation celebrates it with great fervour. On this day, all Shraddhavans perform the ‘Vijayopasana’ as per the guidance of Sadguru Aniruddha. 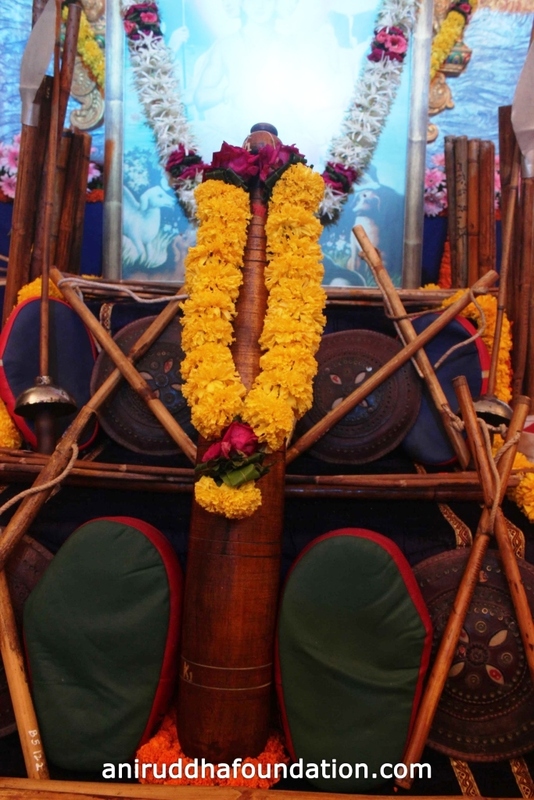 It is on this day that the weapons which are a part of the ‘Ancient Indian Martial Arts’, that are being revived by Sadguru Aniruddha are worshipped. These weapons include the ‘Mudgal’, ‘Fari’, ‘Gada’(Mace), ‘Jodkathi’, ‘Lathi’, ‘Kathi’, etc. The mantra, ‘Om Samarthyasindhu Mahabalotkata Shree Aniruddhaya Namah |’- and gajar of Shree Swami Samarth of Akkalkot is chanted along with other hymns. On Dassera or Vijayadashami, Shraddhavans perform pujan of Shree Mahasaraswati and Shree Saraswati as given by Bapu. A representative symbol of Shree Mahasaraswati and Shree Saraswati are to be drawn on a stone slate and are worshipped with love. These two icons are to be drawn next to each other. We create our destiny. And the energy required to do so comes from these symbols. The union of the pujan of love done with knowledge and that of knowledge with love is nothing but the pujan (worship) of these two symbols.